50 Watt bulb equivalent light output - 11.6 Watt energy used. Save on bulb replacement up to 60,000 hours lamp life. FIVE YEARS LIMITED WARRANTY from the original date of purchase against defects in material and workmanship. This warranty is limited up to the amount of original purchase price of the product, excluding any installation nor repair labour cost. For any inquires call 1-800-345-0542. Globe Electric's 4 pack 3In LED IC Rated Swivel Spotlight Recessed Lighting Kit with white finish is the perfect way to brighten up the interior of your home or commerce with style. Featuring patented PUSH-N-CLICK clips which are fully adjustable and extra wide to grip uneven surfaces and provide easy tool-free installation. A swivel light bulb gives you the ability to focus light on specific areas and can be directed for any desired look. An integrated cut-off switch ensures that the fixture will not overheat and can be used with or without an insulation box. Includes four 50W equivalent MR16 GU10 light bulbs. Dimmable with compatible bulb and dimmer switch. 4-inch LED IC Recessed Gimbal Lighting Kit in White - ENERGY STAR® The Commercial Electric 4 inch Recessed Light Kit includes a IC remodel housing and white trim that gives R20/50Watt equivalent light output-77% energy consumption saving. Compatible with dimmer switch for different illumination needs and increased energy saving. ENERGY STAR certified airtight construction meets California Title 24 requirement. Rated for wet location make it applicable for shower and exterior application. 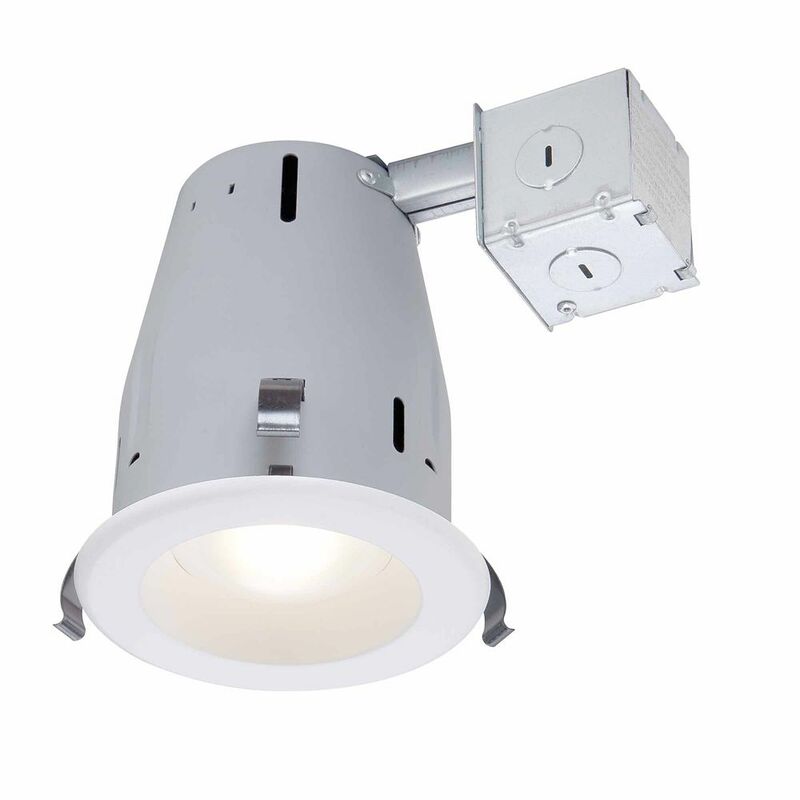 4-inch LED IC Recessed Gimbal Lighting Kit in White - ENERGY STAR® is rated 1.0 out of 5 by 1. Rated 1 out of 5 by Buyingtomuch from Commercial Electric 4in White Recessed LED Kit Do not buy if you want to have no Headache. - The hole needs to be perfect. -Clips are to small to hold if the hole is not dead on size, and I am talking mm tight. The manufacturer is warning you about how critical is the size of the hole. - Not compatible with 3 in 1 insulated ceiling box. Not all clips will go down; one will hit the wall and will be prevented to close. Very poor design. -Save yourself the time to return it.